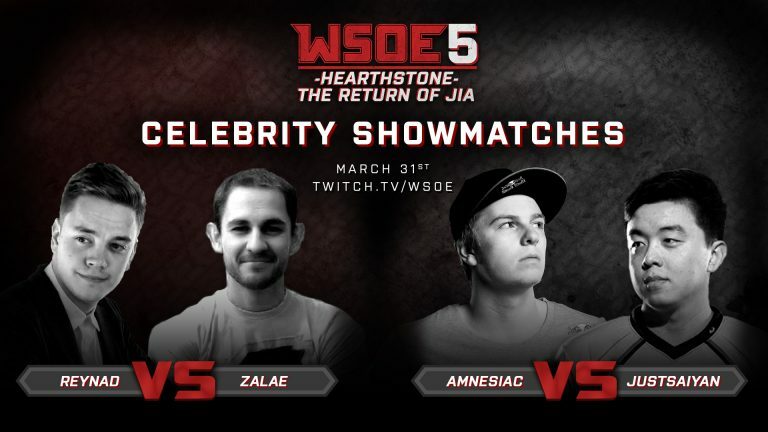 WSOE 5: Hearthstone - The Return of Jia Showmatches! WSOE 5: Hearthstone – The Return of Jia begins in just a couple of days, but we have more players to announce! Joining us for some special WSOE showmatches will be several veteran tournament players with rich competitive histories. On Sunday, March 31st, we are thrilled to announce the addition of Reynad, Zalae, Amnesiac, and Justsaiyan for two Last Hero Standing best of 5 series matches. Our invitees will not just be playing for fun, however, as $2,500 will go to the winner of each match and $500 to the loser. These matches are scheduled to take place after the fight card matches with our WSOE 5 contenders and just before the Championship Match featuring Jia herself! We can’t wait to see what these players have in store for us and what new strategies these experienced competitors will use with our unique format. The nine new Hall of Fame entries will not be allowed in submitted decklists, and the deck drafting before each match will follow the same rules as the WSOE 5 main tournament. Don’t miss a minute of the action on March 30th and 31st! The stream begins each day at 9:45 a.m. Pacific at Twitch.tv/WSOE!